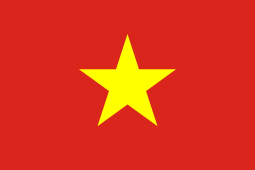 Vietnamese /ˌviɛtnəˈmiːz/ (tiếng Việt) is an Austroasiatic language that originated in the north of Vietnam and is the national and official language of the country. It is the native language of the Vietnamese (Kinh) people, as well as a first or second language for the many ethnic minorities of Vietnam. As the result of Vietnamese emigration and cultural influence, Vietnamese speakers are found throughout the world, notably in East and Southeast Asia, North America, Australia and Western Europe. Vietnamese has also been officially recognized as a minority language in the Czech Republic. It is part of the Austroasiatic language family of which it has by far the most speakers (several times as many as the other Austroasiatic languages combined). Vietnamese vocabulary has borrowings from Chinese, and it formerly used a modified set of Chinese characters called chữ nôm given vernacular pronunciation. The Vietnamese alphabet (quốc ngữ) in use today is a Latin alphabet with additional diacritics for tones and certain letters. Let’s take, for example, technical translations in Vietnamese. All the projects are coordinated by one of the senior company founders, whose competencies are based on technical knowledge, together with a linguistic expert and a Project manager with years of experience in the field of translations. All translations from English into Vietnamese or from Vietnamese to English are done by professional translators. Depending on your requirements, the translations are subsequently verified by a specialist reviewer in the repsective field of expertise. As for medical translations in/from Vietnamese, these translation projects are coordinated by the main founder of the company, whose know-how comes from in-depth medical knowledge, along with a linguist expert and a Project Manager with experience in translations in the medical field. Legal translations in/from Vietnamese are coordinated by a licensed lawyer, together with a linguist expert and a Project Manager with a lot of experience in this area.